Hawaii holds a very sentimental place in my heart. My great-grandmother was born on the island of Oahu, and my mom has frequented Hawaii since she was a teenager. One of my first trips (as a baby) was to Kauai, and once my siblings were born, we started spending time on the Big Island. Every year, for the last 20+ years, we’ve returned to the same piece of paradise on the Big Island. And this trip is no different. We’re staying in the house my grandparents used to co-own. It has a modest floor plan, a wrap-around porch, overgrown vegetation, and beautiful views of the ocean. It has been — and always will be — home away from home. Truthfully, this trip couldn’t have come at a better time. It’s been a taxing last few weeks. I juggle quite a bit in my professional life, and while I enjoy how dynamic things are, I also find that it perpetuates an inevitable cycle of burn out. And burn out is no fun. Last night, unsurprisingly, my body said no más. I can’t remember the last time I felt flu-like symptoms, but let's just say...it was an unpleasant reminder. Thankfully though, I’m on the mend. Bring on the beach naps, Mai Tais, and the best banana bread in the world. Before signing off, I’m sharing a few of my must-have travel essentials. First and foremost, let’s talk about my bag. It’s the McKenna, in Crimson, from Cindy Kirk Designs. In my spare time, I help Cindy’s team with copywriting and social media expertise. Her bags are all hand-made in Idaho with buttery soft hides. Cindy continues to design her entire line with functionality, simplicity, and the modern woman in mind. Her bags are beautiful. Truly. And if you want your own, she has graciously offered Wellness with Edie followers a discount! Use WELLNESSWITHEDIE10 upon checkout. Onto the goods — aka what’s actually in my purse. 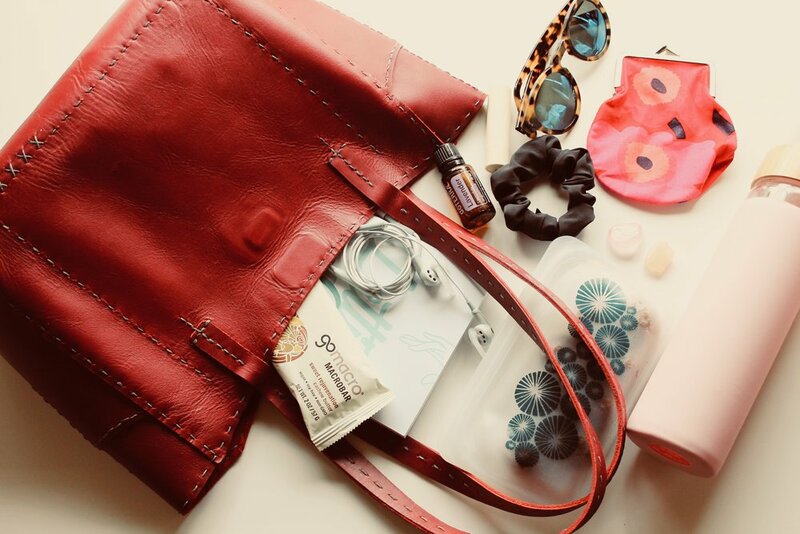 As you'll see, I like to keep things pretty simple: a book, snacks, my headphones, lavender essential oil, chapstick, sunglasses, a hair tie / scrunchy, a crystal or two (I am slightly woo-woo, after all), a coin purse, and my water bottle. I also throw in my laptop, a pair of socks, my iPhone, and an eye mask into this purse. On that note, if I had to choose one item to bring with me, it would be my eye mask. ;) Life changing, people. But I'm curious to know, what your travel essentials? Drop me a comment below! Alright, that’s all from me. Wishing you a wonderful and safe Fourth of July. Cheers to relaxing and recharging.